Happy cows and calves on pasture. 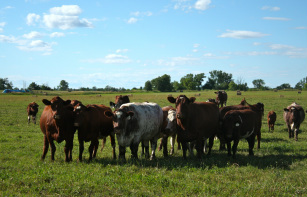 We raise Shorthorn Cattle and we are convinced that they produce a gourmet beef product. Even though they are 100% grass-fed from start to finish, they give us a product that is sensational in the aspect of fat content and flavor. It isn't too lean, yet it isn't too fat either. Don't forget that the fat in our beef is extremely healthy! Much higher in Omega 3, due to the fact that they are grass fed and finished. And the flavor...well lets just say, you won't find it in a grocery store! We breed our brood cows the old fashion way using a bull. At this time we are breeding approx. 20 cows a year. We don't typically purchase any cattle from another herd. We have occasionally purchased a calf or two from a local dairy farmer if we have a cow that has lost her calf and then she becomes a segregate mother to it. However, we do not sell these calves as certified organic because they are not. If the cow doesn't raise a calf for the year than we have to sell her because it is too costly to feed her for another year without an offspring, that's why we often put a calf on her. Our cows are very tame and friendly! They love getting their backs scatted!! 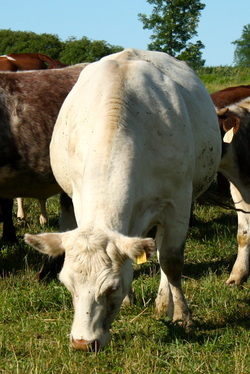 This big white cows name is Misty! We finish most of our beef cattle out at 18 months of age, however, we do keep a few heifers (young female) until they are 24 to 26 months of age to get a better finish on them and to spread out the time of harvest through the year. Most of our beef cattle go for processing late November. It makes it a bit difficult supplying our customers with halves and quarters all year long because we finish on grass and it takes the entire season to get a finish on them. In the winter months we give them all the hay that they can eat along with free choice mineral to supplement them. Including Redmond Salt, Redmond Conditioner, Kelp and other minerals as well. 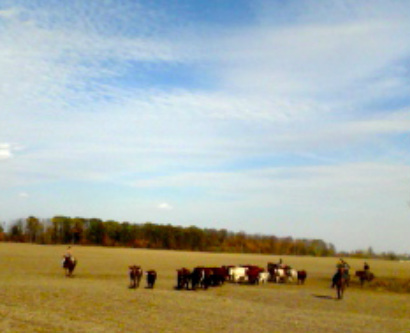 Since 2009 we hold an annual cattle drive at the farm where we invite our customer out to share in the fun of a pot luck, hay ride, horse rides and the opportunity to watch as we bring the cattle across the fields with our horses from one farm to the other. Just like they did in the old days out west! It is a wonderful day and we love being able to share it with you! This takes place sometime within the first two weeks on November each year.